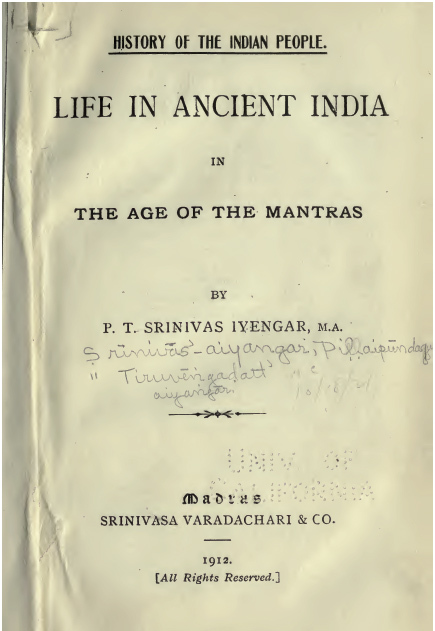 This is the first of a series of monographs on the History of the Indian people, in which an attempt will be made to reconstruct the life of the people of India, age by age from Indian literature, epigraphical records, and records of foreign travellers. 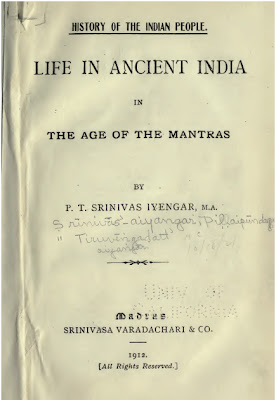 This is a work that can best be done by Indian writers trained in methods of critical investigation ; foreign scholars can scarcely do it well, for they have not that intimate knowledge of Indian life as it is to-day, especially in villages which are remote from the railway and the telegraph and the influence of European commerce and where are still preserved most of the customs described in the following pages ; and without such knowledge, work of this kind cannot be well done. Nor is it work to be undertaken by scholars of the type of the Pandit, who, however estimable his personal character and ideals in life, sees the past through the mist of tradition and believes that Ancient India was in a golden age when the gods roamed the land and supermen taught the people and who is so devoid of the historical sense that he holds everything he has learnt from tradition must be believed in and that an attempt at verification is sacrilege.